Laser Treatment: 7,500 Joules each applied to left elbow and left shoulder (15,000 Total Joules). (Palpated secondary soreness and swelling d/t weight shifting from lameness), beginning three times weekly, then weaning frequency as patient improved. Patient Updates: After June 2013 Rio received maintenance laser treatments once weekly to his elbow 4-8 weeks for the following year and then only on an “as needed” basis. He is not on any systemic medications, just a chondroprotectant supplement in his feed daily. Dr. Lisa Miller is a graduate of the University of Tennessee, College of Veterinary Medicine. After graduation in 2003, Dr. Miller completed an internship in internal medicine and then became certified in canine rehabilitation therapy at the Canine Rehabilitation Institute. Working in a large referral practice, she practiced canine rehabilitation, sports medicine, neurological rehabilitation and acupuncture for several years before returning to general small animal practice. Always maintaining an interest in the canine athlete/performance dog, Dr. Miller is also active on the health committees for two purebred dog breed clubs. 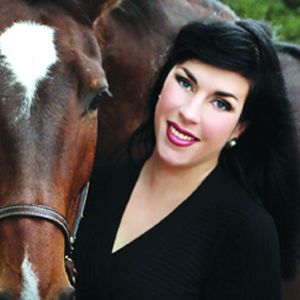 Dr Miller is a horse owner and enthusiastic equestrian.